For Christmas this year, Mr. Bread Maiden and I gifted each other our favorite things: cookbooks! I received Marcella Kriebel’s Mi Comida Latina, and I gave Mr. Bread Maiden Francis Mallmann’s Seven Fires. 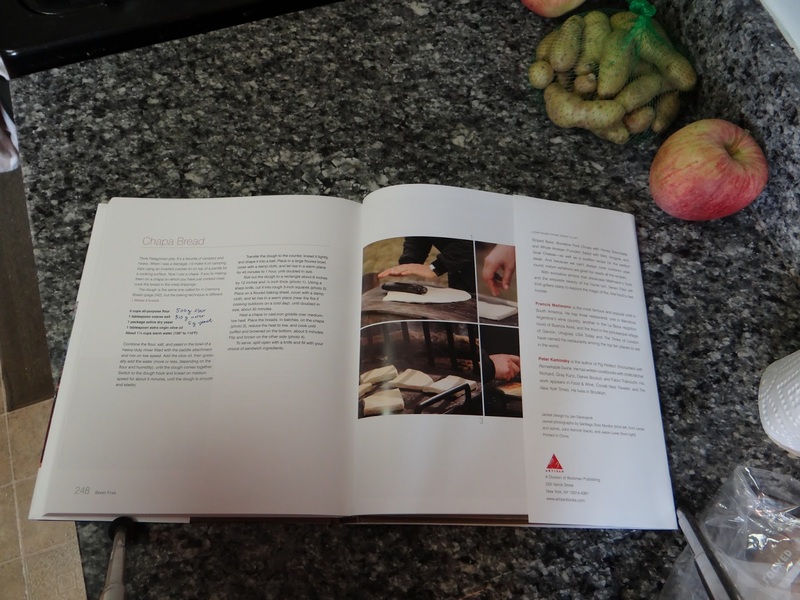 Mallman doesn’t focus much on the breads section of his book, but one recipe really jumped out at me: Pan de Chapa. 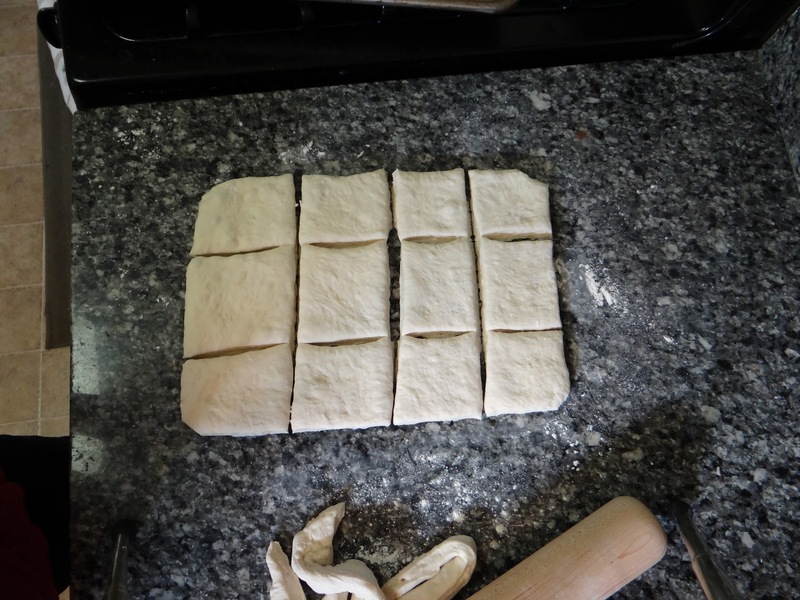 The only bread I ate in Argentina was their version of french bread rolls (edit: also tortas mendocinas, aka sopaipillas). So I was interested in trying this out. 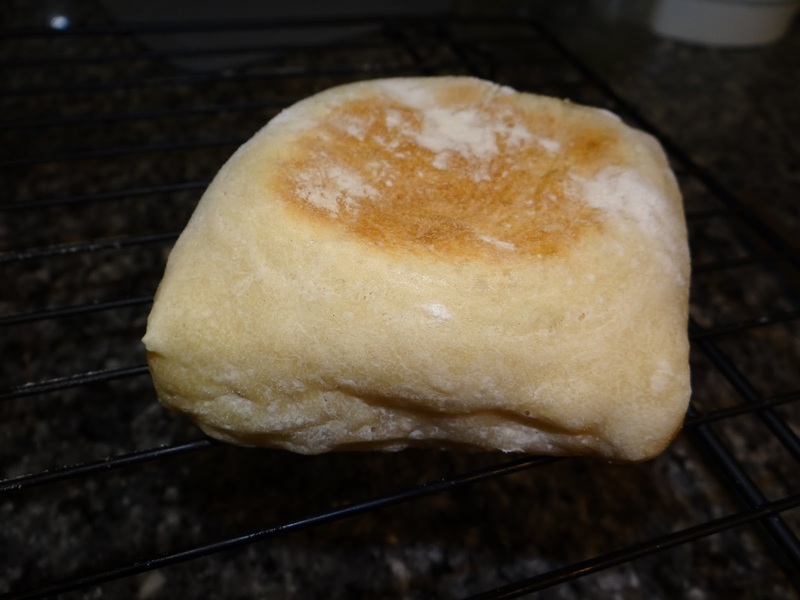 A few weeks ago, my MIL and I made her famous English muffins. 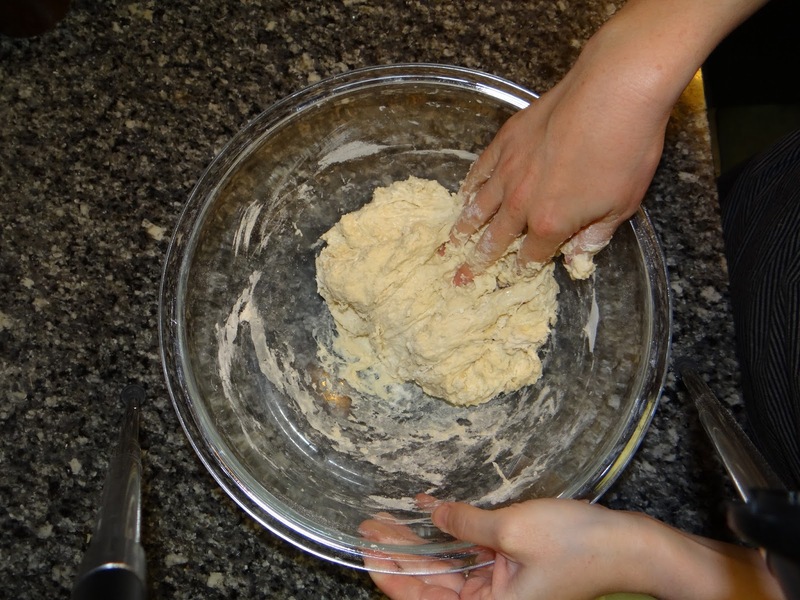 They use up a lot of sourdough starter, which can be good if you find yourself with a surplus. 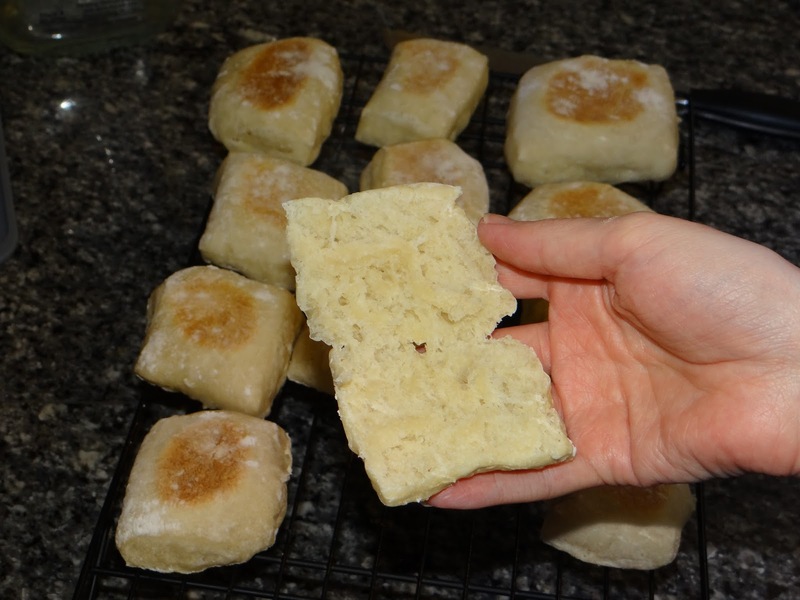 This pan de chapa recipe didn’t originally contain sourdough starter, but I thought it would add some good flavor since they don’t ferment for very long. 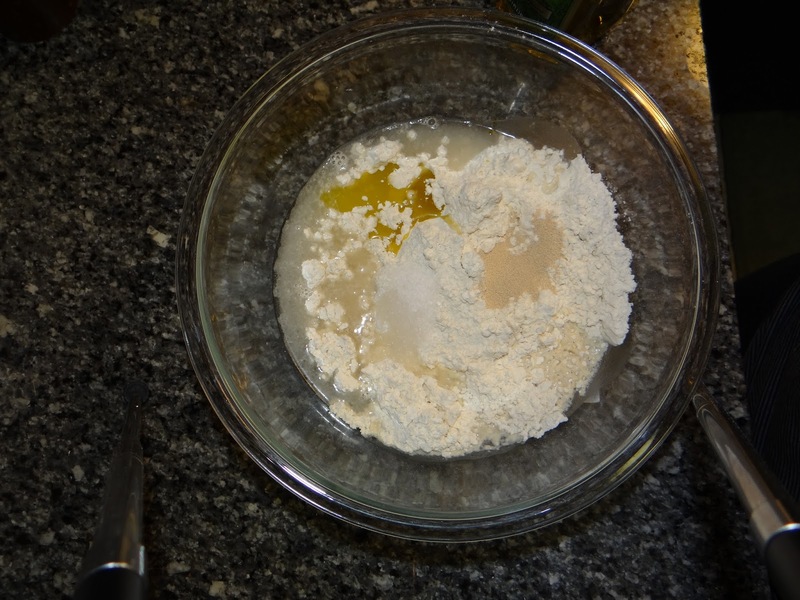 The recipe still relies on commercial yeast for the rise, though. 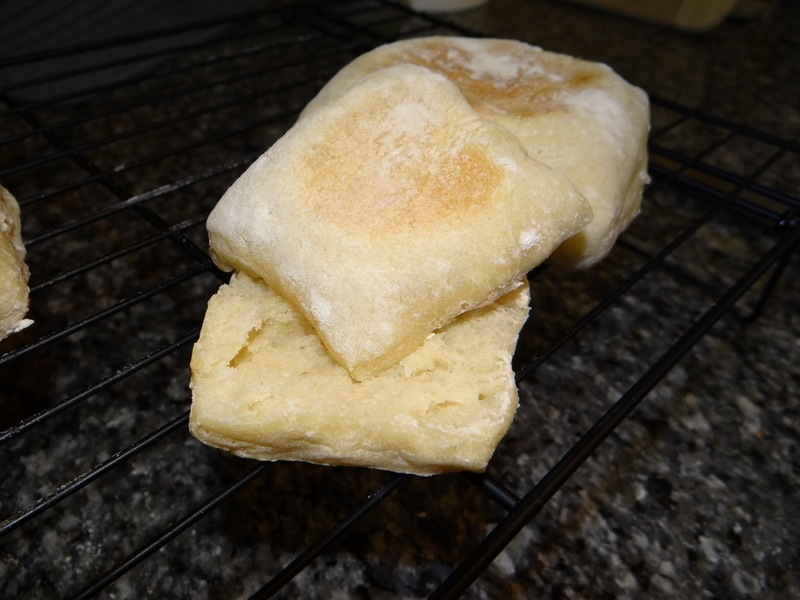 I used my MIL’s English muffin recipe as a guide for cooking these panes de chapa because Mallmann’s recipe is not very specific. 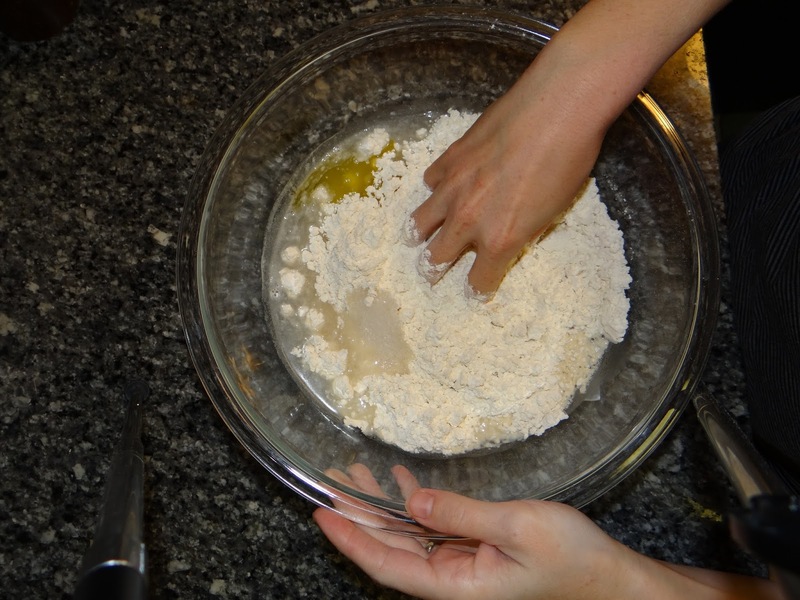 For one thing, the recipe is by volume, not weight. This is a shame since Mallmann is Argentine, so clearly someone had to convert the recipes to volume for the US version of his book. Why not include both sets of measurements next time? 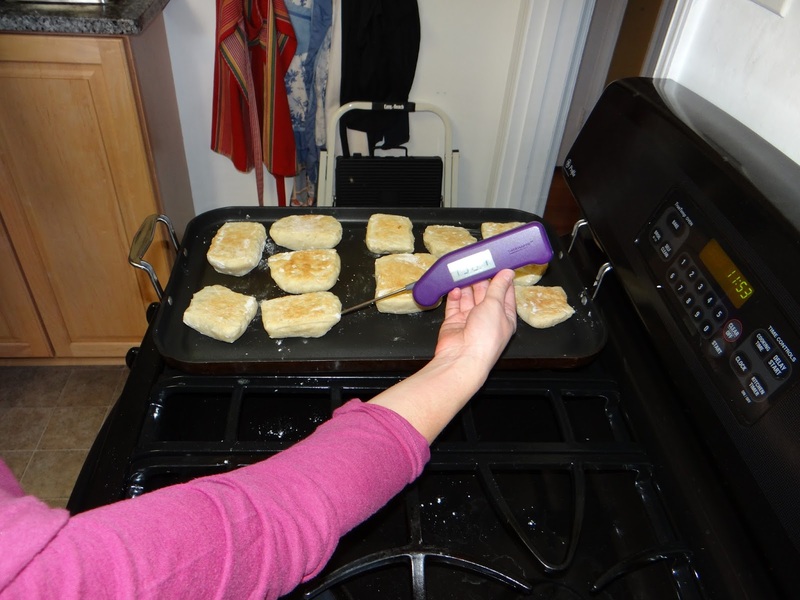 Also, he calls for a griddle that is preheated to “medium-low,” then “low.” What does that mean in the context of a griddle placed on a roaring fire? Does he mean medium-low for a stove burner? 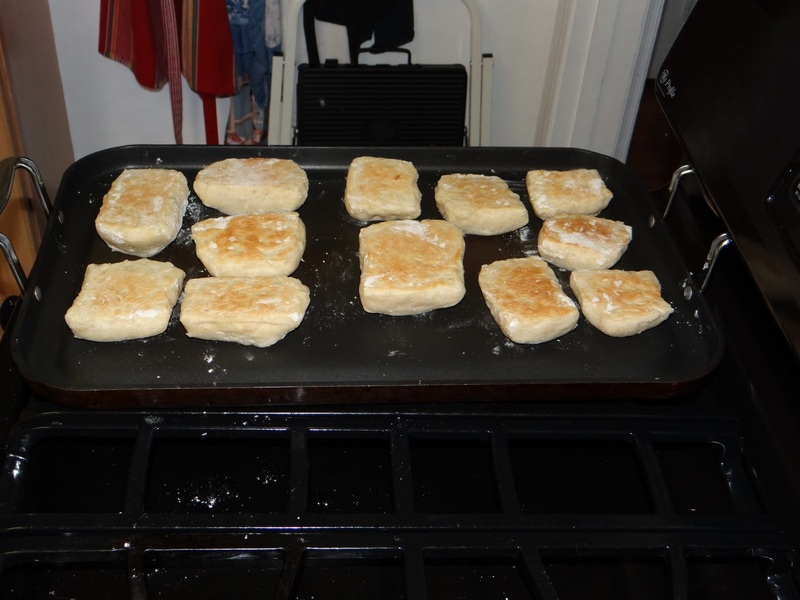 In this case, the English muffin recipe called for a griddle at 350 degrees F, so that is what I did. 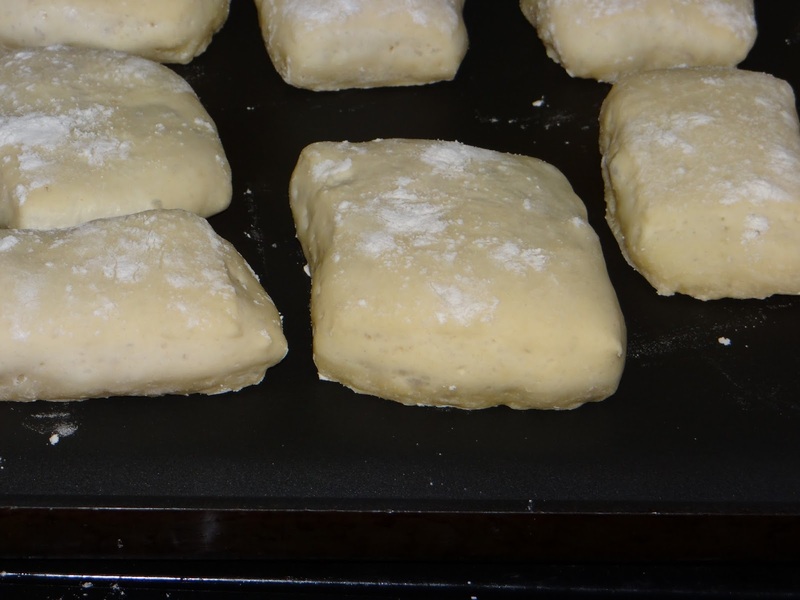 Pan de chapa means hotplate bread. 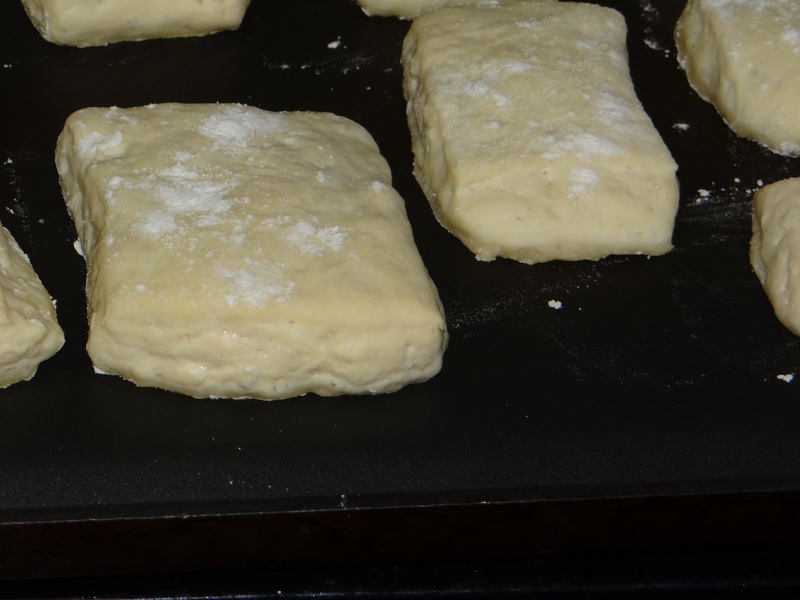 I call it griddle bread because I think it sounds better, and because I cook them on a griddle. 1. 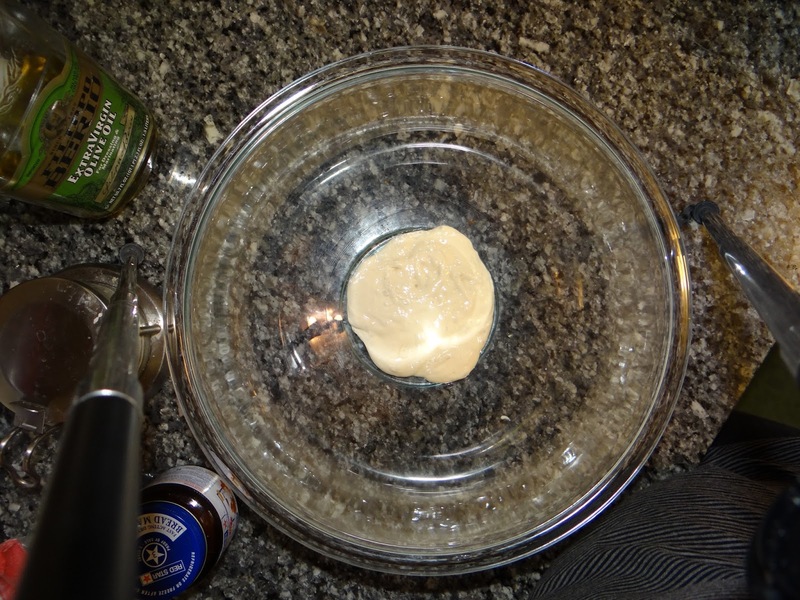 Mix together the ingredients until combined. 2. 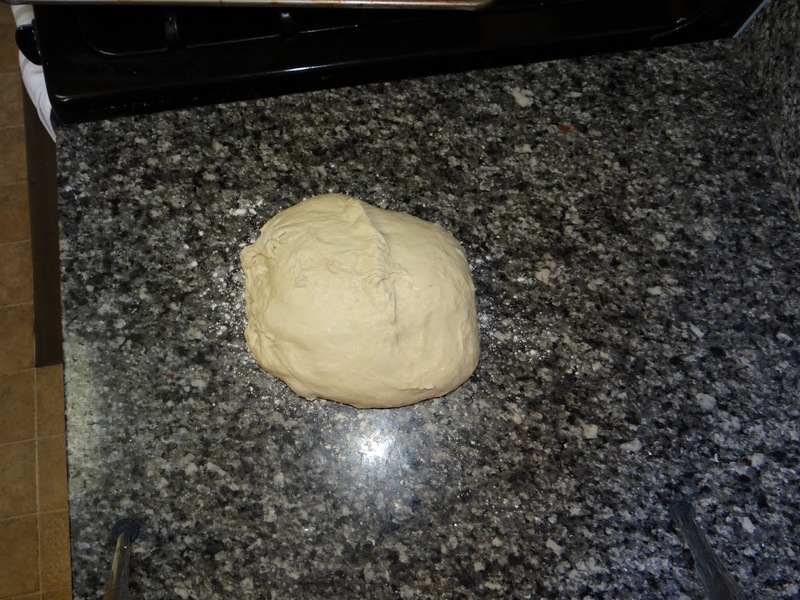 Let the dough rest for about five minutes, then stretch and fold a few times. 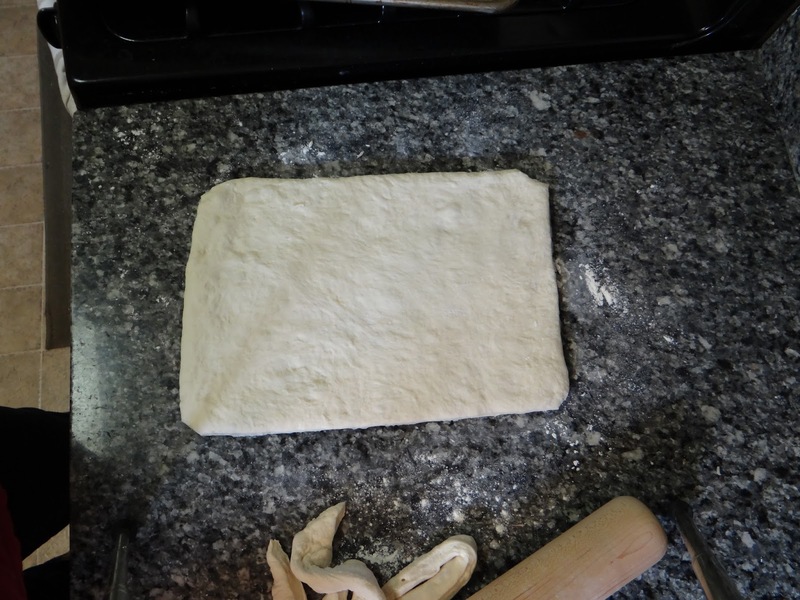 Cover tightly and let rise in a warm place for about an hour. 3. 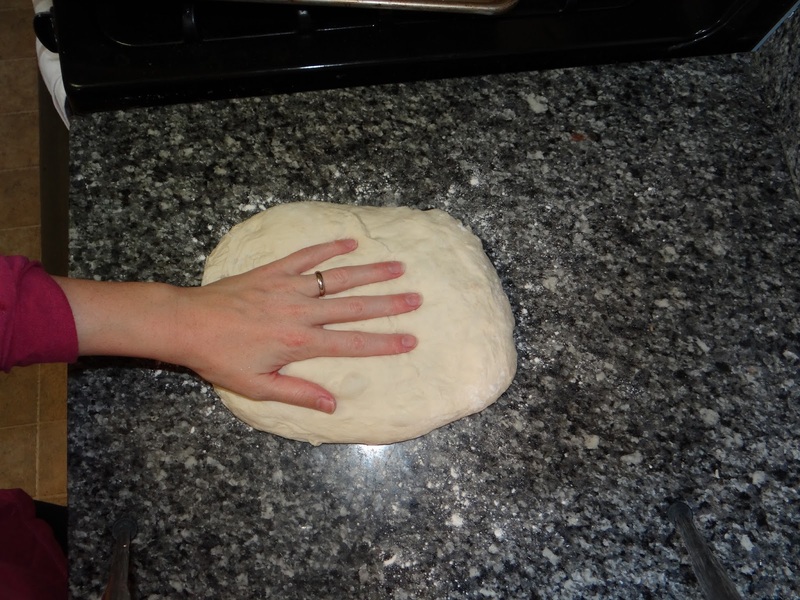 Place the dough on a floured surface and roll it out with a rolling pin until it’s about 8×12”. 4. 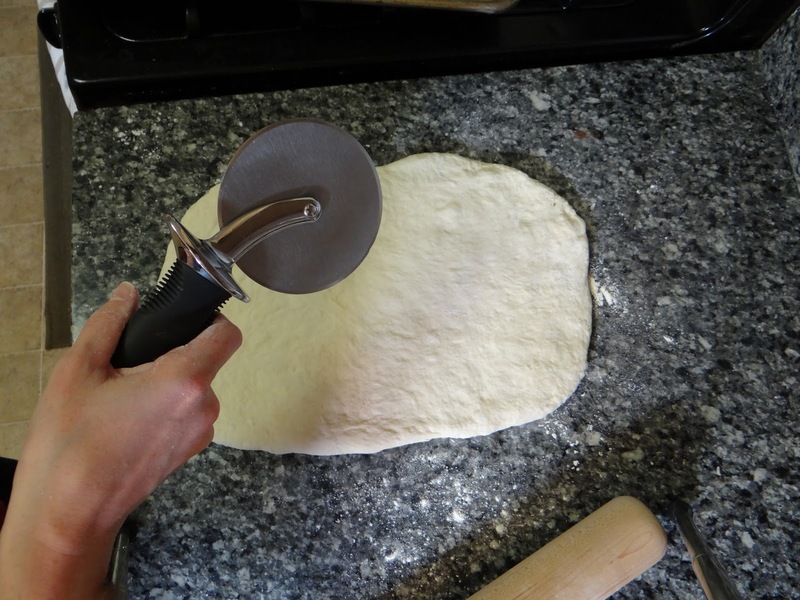 Using a pizza slicer, cut off the uneven ends, then divide into squares. Mine are each about 2-3 inches on each side. 5. 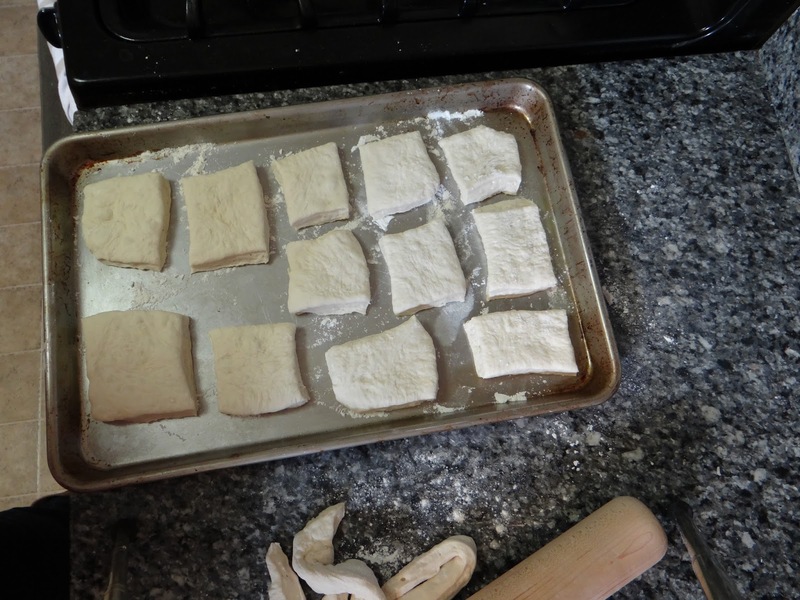 Transfer squares to a floured baking sheet, cover and let rise again for another 30 minutes. 6. 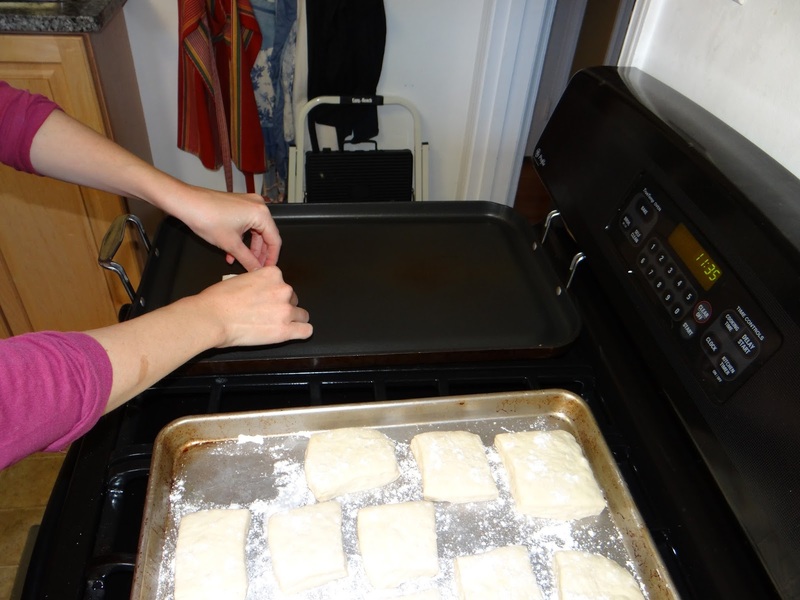 At about 15 minutes before you plan to cook the breads, start warming the griddle. 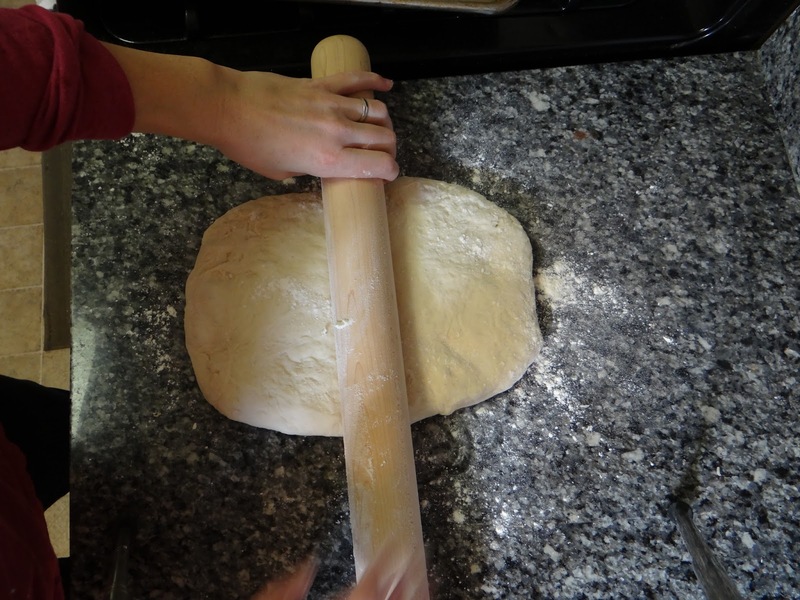 You want it to be about 350 degrees F.
7. 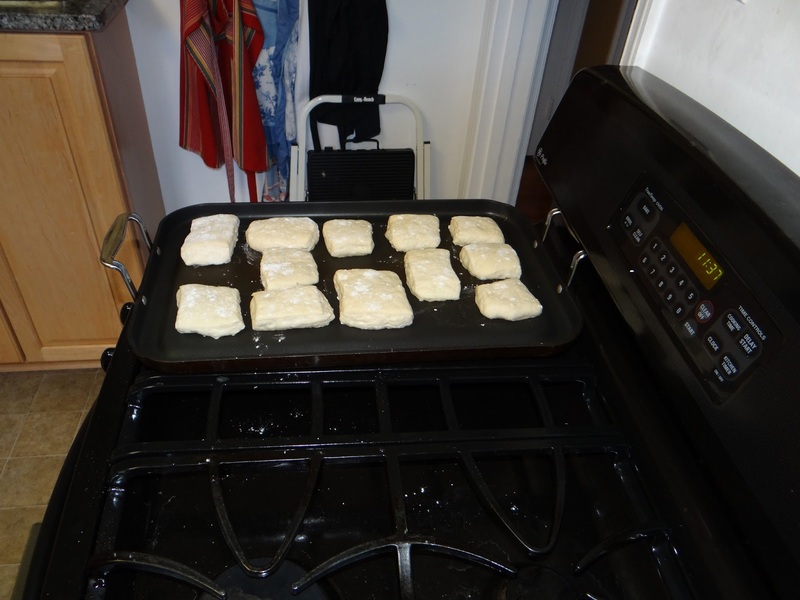 Transfer the pieces to the griddle and let them cook until the bottom is brown, then flip. 8. 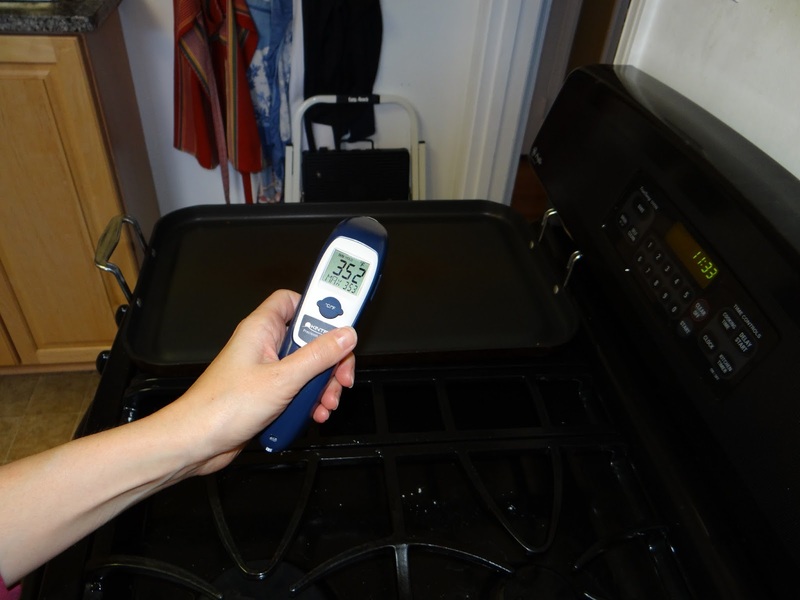 Let cook until the internal temperature reaches 190 degrees F.
9. 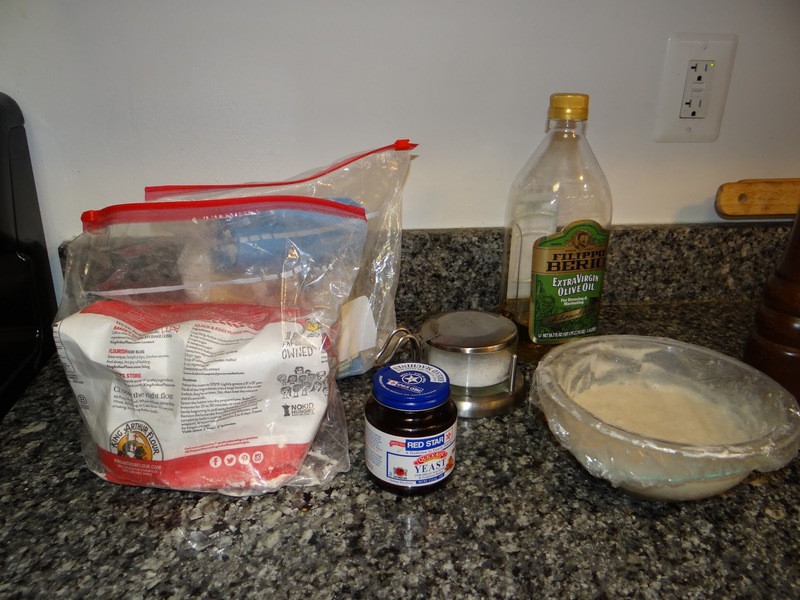 Move the finished pieces to a cooling rack. Once they are completely cool, you can slice them open and eat with butter or use them for sandwiches. 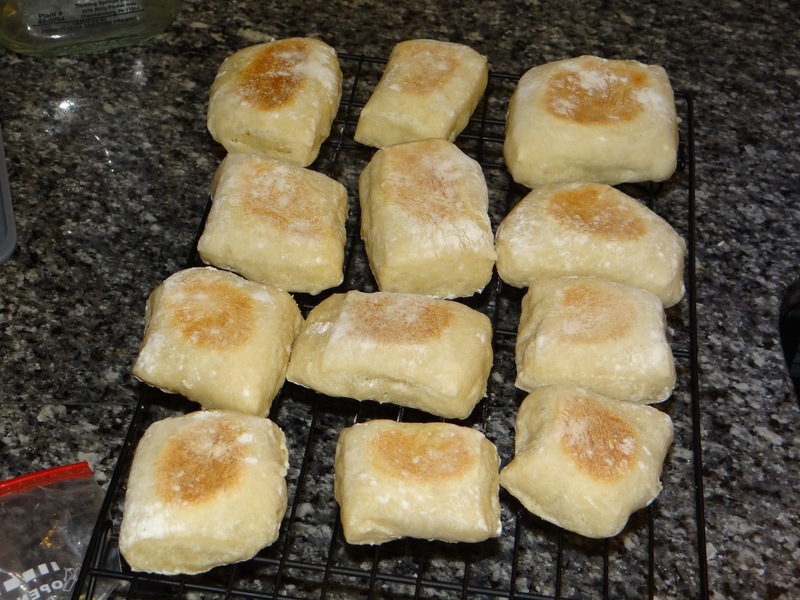 These are a bit small for sandwiches, so I’ll probably toast them and eat them for breakfast with butter and jam. 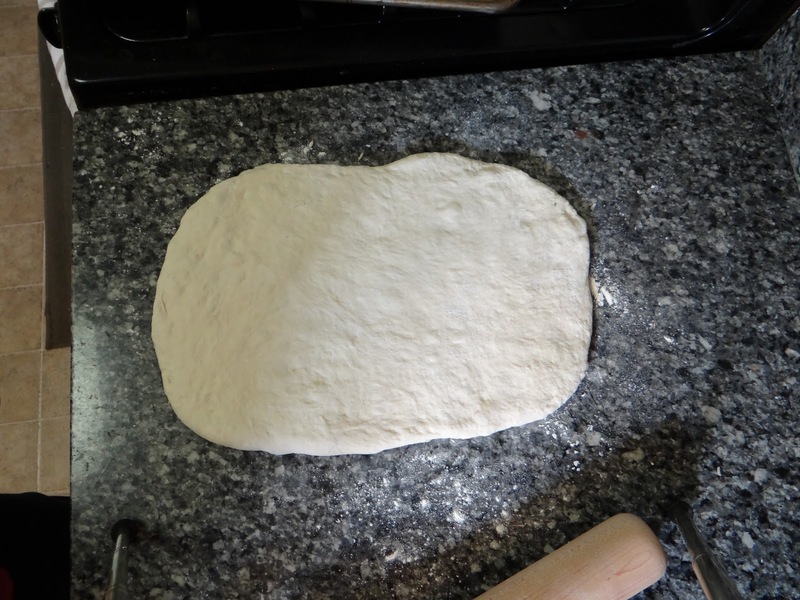 I’ll definitely make them again – the sourdough adds a really nice flavor to the pan de chapa. 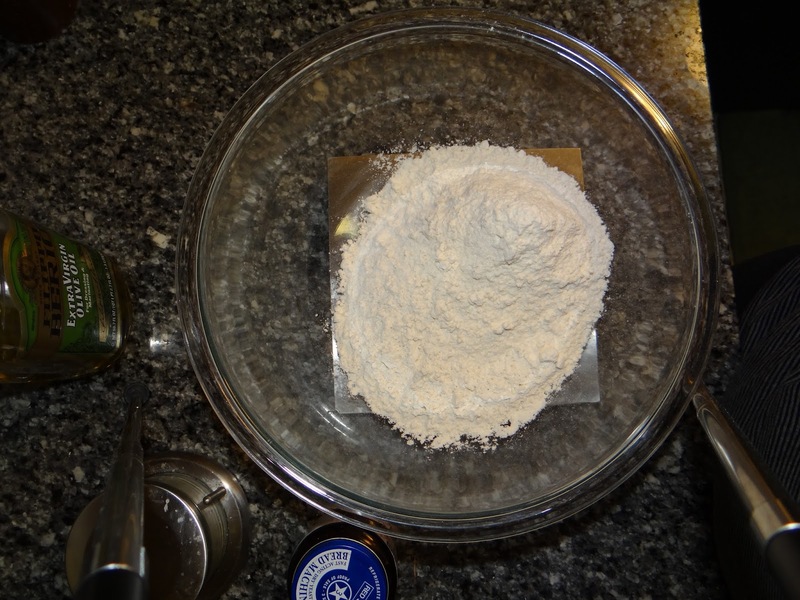 I’m thinking since the cooking method is different from most of my other breads, I’ll do a “The Science Behind…” post on pan de chapa. Stay tuned!